Part of SR 82 from I-880 to US 101 was relinquished in mid-2013 and is no longer included in the route. State Route 82 (SR 82) is a state highway in the U.S. state of California that runs from Interstate 880 (I-880) in San Jose to I-280 in San Francisco following the San Francisco Peninsula. 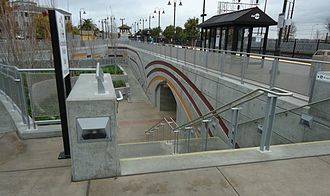 It is the spinal arterial road of the peninsula and runs parallel to the nearby Caltrain line along much of the route. 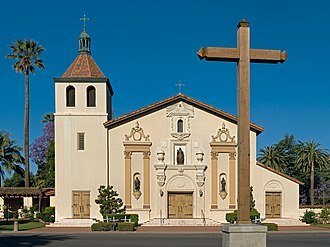 For much of its length, the highway is named El Camino Real and formed part of the historic El Camino Real mission trail. 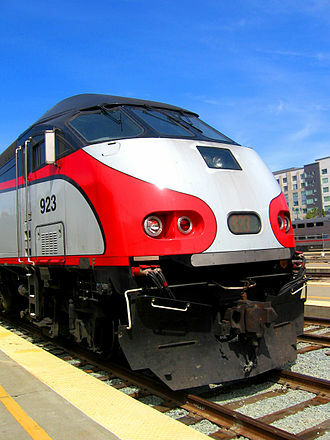 It passes through and near many the historic downtowns of many Peninsula cities, including Burlingame, San Mateo, Redwood City, Menlo Park, Palo Alto, Mountain View, and Sunnyvale, and through some of the most walkable and transit-oriented neighborhoods in the region. At its south end SR 82 starts as The Alameda at I-880 in San Jose. 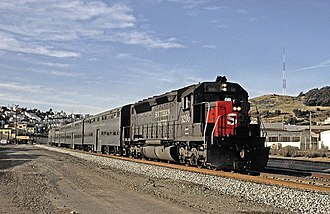 Once it enters Santa Clara, it bends north-east around Santa Clara University and onto El Camino Real, where it continues for the remainder of its trip up the San Francisco Peninsula, paralleling the Caltrain corridor. 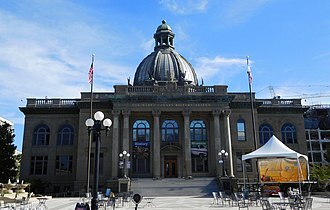 SR 82, generally called "El Camino" by local residents, runs through a number of cities on the Peninsula, including Palo Alto (passing by Stanford University), San Carlos, San Mateo, Burlingame, and Millbrae, and it is a central artery of the Peninsula communities through which it passes. In Daly City, SR 82 becomes Mission Street, connecting with San Francisco's Mission Street, but then quickly flows onto San Jose Avenue, crossing Alemany Boulevard, and terminating at I-280. SR 82 takes an inland course paralleling US 101. The entire route is at street level with at least four lanes of traffic; no portions of it exist as a freeway, although the route is occasionally a divided highway. The Bayshore Freeway and I-280 tend to provide faster alternatives than Route 82 even during traffic jams on those freeways. From 1964 to 1968, SR 82 continued past its current end north on Alemany Boulevard to Bayshore Boulevard in San Francisco (see below). Prior to 2013, SR 82 continued past its current south end on The Alameda, becoming Santa Clara St. in Downtown San Jose then turning south on Montgomery St. (southbound) / Autumn St. (northbound); then it turned east on San Carlos St. It turned south on Market St., which becomes 1st St. and then Monterey Highway. It followed Monterey Highway until it turned east briefly on Blossom Hill Road, where it ended at US 101. This relinquished segment south of I-880 within San Jose is legally no longer a state highway, but the state's Streets and Highways Code mandates that the City of San Jose is still required to maintain "signs directing motorists to the continuation of Route 82" and "ensure the continuity of traffic flow" on this segment. Signs along US 101, I-280, and SR 87 where these relinquished segments intersect still have SR 82 shields. Though as of 2017, certain signs with SR 82 shields have been removed along US 101 near Blossom Hill Road and Capitol Expressway. SR 82 is part of the National Highway System, a network of highways that are considered essential to the country's economy, defense, and mobility by the Federal Highway Administration. Originally a segment of US 101 (and before that, the historic El Camino Real), the highway became completely inadequate for the needs of traffic with the rapid growth of the San Francisco Bay Area after World War II, including urbanization of the towns along its path. The Bayshore Highway to the east was originally built as "Bypass (BYP) US 101" and was upgraded to a freeway in 1937. With this upgrade, the original US 101 route was transferred to the Bayshore Freeway, and El Camino Real became US 101 BYP, but in response to protests, the switch in designations was reversed two years later, in 1939, and the Bayshore Freeway remained US 101 BYP until 1964. In 1964, US 101 was moved again onto the Bayshore Freeway, and its former alignment on El Camino Real became SR 82. 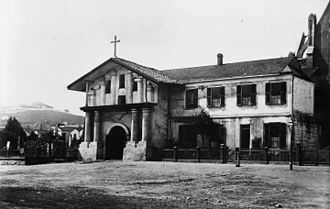 It was defined as two portions: From Route (US) 101 near Ford Road south of San Jose to Route (US) 101 in San Francisco (which today corresponds to the Alemany Maze), and from Route (US) 101 near Alemany Boulevard to Route (SR) 87 (current unconstructed SR 230) in San Francisco. In 1968, the portions from I-280 (at current SR 82) to US 101 and from SR 101 to SR 87 were transferred to I-280. SR 87 was then deleted north of SR 237 in 1980, and is only constructed south of US 101, and SR 82 today is designated as part of El Camino Real. In 2013, SR 82 was relinquished south of I-880 through San Jose. 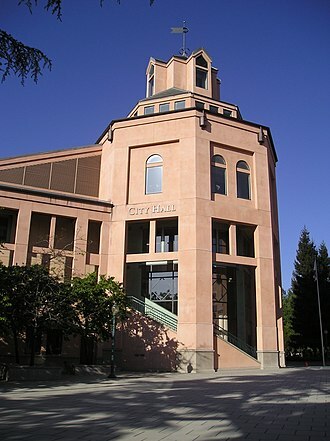 However, the state's Streets and Highways Code states that the City of San Jose is still required to "ensure the continuity of traffic flow on the relinquished former portion of Route 82" along The Alameda into downtown San Jose, and from there along Monterey Highway to its former terminus at Blossom Hill Road and US 101. The city also has the further option to apply to make this segment a business route. The Grand Boulevard Initiative is a partnership of nineteen Bay Area transit agencies and municipalities that operate or manage various portions of the route. 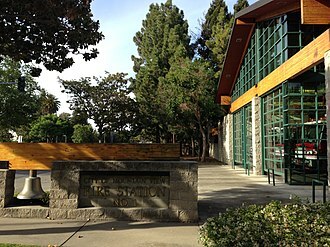 Although El Camino Real is ultimately under the stewardship of Caltrans, the organization nevertheless sponsors aesthetic and infrastructural improvements along the corridor and its neighboring parcels in order to revitalize the streetscape and promote density and more walkable and transit-oriented development. Except where prefixed with a letter, postmiles were measured on the road as it was in 1964, based on its original southern terminus at US 101, and do not necessarily reflect current mileage. R reflects a realignment in the route since then, M indicates a second realignment, L refers an overlap due to a correction or change, and T indicates postmiles classified as temporary (for a full list of prefixes, see the list of postmile definitions). Segments that remain unconstructed or have been relinquished to local control may be omitted. The numbers reset at county lines; the start and end postmiles in each county are given in the county column. ^ a b c d e f g h i j Postmiles are measured from SR 82's original southern end at US 101, before the segment south of I-880 was deleted and relinquished to local control. However, the City of San Jose is still required under the California Streets and Highways Code to "ensure the continuity of traffic flow on the relinquished former portion of Route 82" with the further option to apply "for approval of a business route designation". ^ Jarrett Walker (November 14, 2014). "Silicon Valley: bus rapid transit that's faster than driving?". Human Transit. Retrieved June 22, 2015. ^ a b c California State Legislature. "Streets and Highways Code Section 300-635". Sacramento: California State Legislature. Archived from the original on October 6, 2014. Retrieved April 10, 2016. Section 382: Route (SR) 82 is from Route (I) 880 in San Jose to Route (Interstate) 280 in San Francisco. The relinquished former portion of Route 82 within the City of San Jose is not a state highway ... for the relinquished former portion of SR 82, the City of San Jose shall maintain within its jurisdiction signs directing motorists to the continuation of Route 82 and shall ensure the continuity of traffic flow on the relinquished former portion of SR 82. The city may apply to the department for approval of a business route designation. ^ a b c d e "California Highways (www.cahighways.org): Routes 81 through 88". California Highways. Retrieved 27 January 2014. ^ Federal Highway Administration (March 25, 2015). National Highway System: San Francisco, CA (PDF) (Map). Scale not given. Washington, DC: Federal Highway Administration. Retrieved October 10, 2017. Federal Highway Administration (March 25, 2015). National Highway System: San Jose, CA (PDF) (Map). Scale not given. Washington, DC: Federal Highway Administration. Retrieved October 10, 2017. ^ Oakland Tribune, October 1, 1939: "The Pacheco Pass road, a good connection between coast and inland routes, is reached over pavement via U.S. 101 or U.S. 101 Bypass to San Jose..."
Wikimedia Commons has media related to California State Route 82. Interstate 880 is an Interstate Highway in the San Francisco Bay Area connecting San Jose and Oakland, running parallel to the northeastern shore of San Francisco Bay. For most of its route, I-880 is officially known as the Nimitz Freeway, after World War II fleet admiral Chester Nimitz and this route is part of the California Freeway and Expressway System. The southern terminus of I-880 is at its interchange with Interstate 280, from there, it heads roughly northeast past the San Jose International Airport to U. S. Route 101. In Oakland, I-880 passes by Oakland International Airport, Oakland-Alameda County Coliseum, the northern terminus of I-880 is in Oakland at the junction with Interstate 80 and Interstate 580, near the eastern approach of the Bay Bridge. I-880 between I-238 in San Leandro and the MacArthur Maze is used as a truck route. Officially, the Nimitz Freeway designation is Route 880 from Route 101 to Route 80, as named by Senate Concurrent Resolution 23 and it turned north at Cypress Street, passing through the Bay Bridge Distribution Structure and following a newly constructed alignment to El Cerrito. 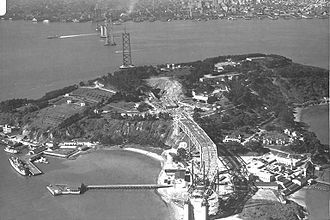 The first short piece of the new Eastshore Freeway opened to traffic on July 22,1949 and it was extended to 98th Avenue on June 1,1950, Lewelling Boulevard on June 13,1952, and Jackson Street on June 5,1953. At the San Jose end, the overlap with Route 5 between Bayshore Highway and Warm Springs was bypassed on July 2,1954, within Oakland, the double-decker Cypress Street Viaduct opened on June 11,1957, connecting the freeway with the San Francisco–Oakland Bay Bridge. As these sections opened, Sign Route 17 was moved from its old surface routing, other than Route 5 south of Warm Springs, the portion from San Leandro into Oakland was kept as part of Route 105. Prior to 1984, the known as I-880 used to be part of State Route 17. SR17 used to run from Santa Cruz all the way through San Jose, Oakland, in 1947, construction commenced on a freeway to replace the street routing of SR17 through the East Bay. In 1958, the south of the MacArthur Maze was renamed the Nimitz Freeway in honor of WWII Admiral Nimitz. The northern portion of I-880 was designated Business U. S. Route 50 for a time between the I-80 interchange and downtown Oakland, from 1971 to 1983, Interstate 880 was the original route designation for the Beltline Freeway, the northern bypass freeway for the Sacramento area. The now-designated Capital City Freeway was the original I-80 routing, continuing southwest directly into downtown Sacramento, I-80 was re-routed along the Beltline Freeway in 1983, while the Capital City Freeway became Interstate 80 Business. 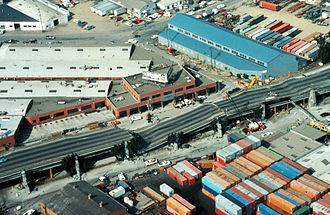 This was the greatest loss of life caused by that earthquake, the freeway reopened in July 1997 on a new route parallel to railroad tracks around the outskirts of West Oakland with the entire project being completed shortly before 2000. 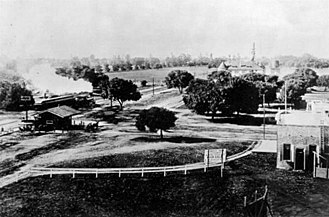 Although only about three miles in length, the replacement freeway cost over $1, the former path of the structure, Cypress Street, was renamed Mandela Parkway, and the median where the freeway stood became a landscaped linear park. Several aspects of the I-880 facility have been constructed in designated floodplains such as the 1990 interchange improvements at Dixon Landing Road, in that case the Federal Highway Administration was required to make a finding that there was no feasible alternative to the new ramp system as designed. 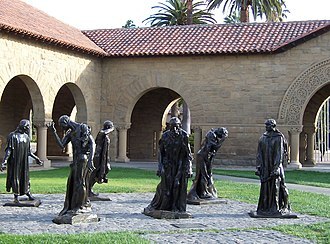 Mountain View is a city located in Santa Clara County, United States, named for its views of the Santa Cruz Mountains. From its origins as a stop, it grew to a large suburb with a pedestrian-friendly downtown, free wi-fi. 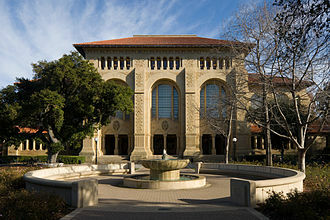 The city borders Palo Alto and the San Francisco Bay to the north, Los Altos to the south, situated in the southern end of the San Francisco Peninsula in the San Francisco Bay Area, Mountain View is home to many high technology companies. 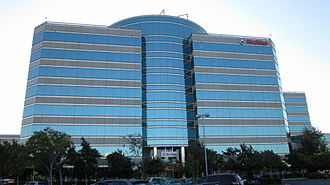 In 1956, Shockley Semiconductor Laboratory, the first company to develop silicon semiconductor devices in what came to be known as Silicon Valley, was established in the city by William Shockley. Today, many of the largest technology companies in the world are headquartered in the city, including Google, Mozilla Foundation and Intuit. The original Byte Shop computer store was opened at 1063 El Camino Real, Mountain View by Paul Terrell, the Santa Clara Valley Transportation Authority integrates the city with the neighboring cities of Palo Alto, Los Altos, and Sunnyvale. The Mexican land grant of Rancho Pastoria de las Borregas was given in 1842 by Alta California Governor Juan Alvarado to Francisco Estrada. This grant was passed on to Mariano Castro, who sold half of the land to Martin Murphy, Jr. Eventually. First known as the center of Fremont Twp. 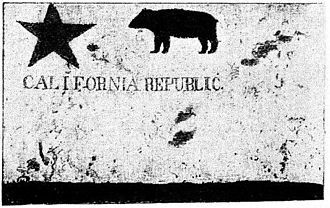 before the first California 1852 census. 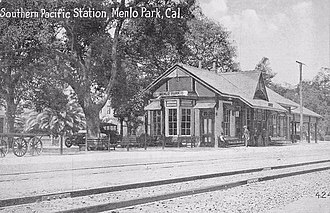 Which meant that it was a predecessor to Mayfield and Palo Alto, Mountain View Station, officially named in 1864, had its beginnings earlier as a stagecoach stop on the route between San Francisco and San Jose, including the Butterfield Overland Mail. 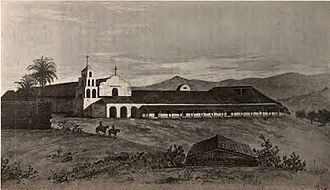 & El Camino Real of today, was closer to what was once the town center. 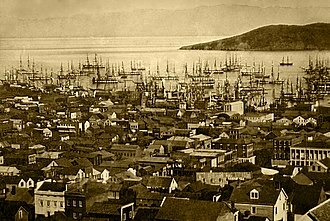 The early pioneers were buried at the old cemetery between Mercy & Church, off Castro Street, now the present city Library and park. Reverend Henry Merrill Henderson, born in Maryland, age 35, arrived in Spring of 1852, with his family to meet with relatives Ricketts and he was the first Baptist minister in town and soon was going by horse to Half-Moon Bay, and McCartersville for services. U. S. Route 101 in the state of California is one of the last remaining and longest U. S. Routes still active in the state, and the longest highway of any kind in California, US101 was one of the original national routes established in 1926. Significant portions of US101 between the Los Angeles area and the San Francisco Bay Area follow El Camino Real, the road connecting the former Alta Californias 21 missions. US101 has designated as the Santa Ana Freeway, Hollywood Freeway, Ventura Freeway, South Valley Freeway. This route is part of the California Freeway and Expressway System, the south terminus of US101 is in Los Angeles, about one mile east of downtown Los Angeles at the East Los Angeles Interchange, known as the Commuters Complex. This southernmost portion is named the Santa Ana Freeway, inheriting that title as the extension of the roadway now known as I-5. From here, US101 becomes the Hollywood Freeway and it heads to Hollywood and up through the Cahuenga Pass before reaching the San Fernando Valley. US101 intersects with SR134 and SR170 at the known as the Hollywood Split. Here, the alignment of US101 shifts to the alignment of SR134, though confusing, the Hollywood Freeway name continues northward from this interchange on SR170, and the Ventura Freeway name continues eastward to SR134. 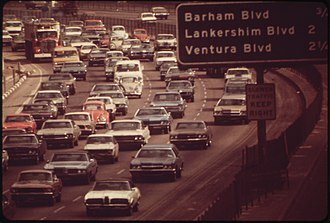 From the Hollywood Split, US101 is an east–west highway and it meets with I-405 in Sherman Oaks, an interchange which holds claim to the most traveled intersection in the nation. Upon reaching Ventura, there is an interchange with SR126, North of Ventura, US101 switches intermittently between freeway and expressway status, but there are no traffic signals until San Francisco. From Ventura and through Santa Barbara, US101 closely follows the Pacific coastline until Gaviota State Park, at Gaviota State Park, the highway shifts back from an east–west highway to a north–south alignment. About one mile north of this point, US101 passes through the Gaviota Tunnel, a few miles north of the Gaviota Tunnel, SR1 splits from US101 and heads northwest, running along the Pacific coastline parallel and to the west of US101. The California Department of Transportation is an executive department within the U. S. state of California. Caltrans manages the highway system and is actively involved with public transportation systems throughout the state. 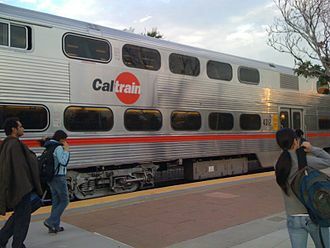 It supports Amtrak California and the Capitol Corridor, the department is part of the state cabinet-level California State Transportation Agency. 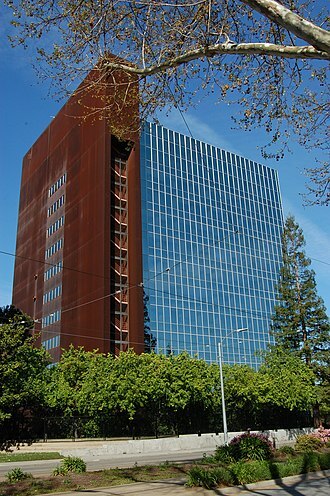 Like the majority of government agencies, Caltrans is headquartered in Sacramento. In 2015, Caltrans released a new statement, Provide a safe, sustainable and efficient transportation system to enhance California’s economy. The earliest predecessor of Caltrans was the Bureau of Highways, which was created by the California Legislature and this agency consisted of three commissioners who were charged with analyzing the state road system and making recommendations. 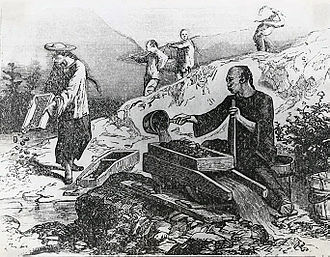 At the time, there was no highway system, since roads were purely a local responsibility. After the commissioners submitted their report to the governor on November 25,1896, voters approved an $18 million bond issue for the construction of a state highway system in 1910, and the first Highway Commission was convened in 1911. 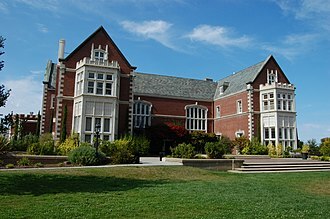 On August 7,1912, the department broke ground on its first construction project, the year 1912 saw the founding of the Transportation Laboratory and the creation of seven administrative divisions. In 1913, the legislature started requiring vehicle registration and allocated the funds to support regular highway maintenance. 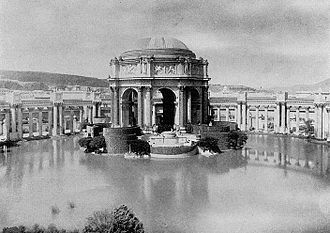 In 1921, the legislature turned the Department of Engineering into the Department of Public Works, the history of Caltrans and its predecessor agencies during the 20th century was marked by many firsts. 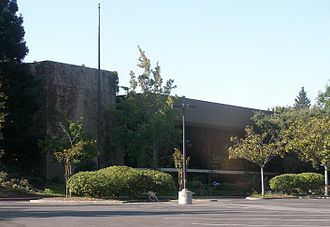 In late 1972, the legislature approved a reorganization in which the Department of Public Works was merged with the Department of Aeronautics to become the modern Department of Transportation, for administrative purposes, Caltrans divides the State of California into 12 districts, supervised by district offices. Most districts cover multiple counties, District 12 is the district with one county. 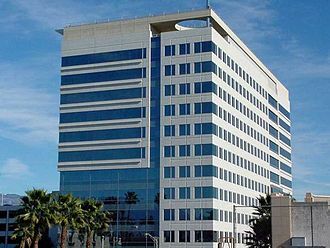 The largest districts by population are District 4 and District 7, like most state agencies, Caltrans maintains its headquarters in Sacramento, which is covered by District 3. 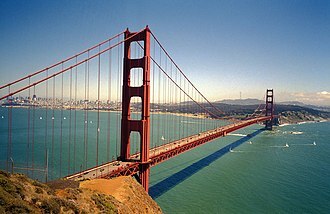 State Route 92 is an east-west highway in the San Francisco Bay area between Half Moon Bay near the coast in the west and downtown Hayward at its junction with State Route 238 and State Route 185. 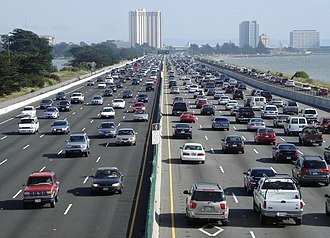 It is most notable for being the route traverses the San Mateo Bridge. 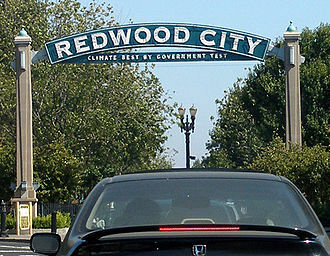 It has interchanges with three freeways, Interstate 280, U. S. Route 101 in or near San Mateo and it connects indirectly to Interstates 238 and 580 by way of Haywards Foothill Boulevard, which carries Route 238 and flows directly into Route 92. This route is part of the California Freeway and Expressway System and is eligible for the State Scenic Highway System, however, it is not a scenic highway as defined by Caltrans. Between Half Moon Bay and Interstate 280, Route 92 winds through the Coast Range as a narrow, the east-bound uphill portion was upgraded with a long passing lane. Between Interstate 280 and Interstate 880 it is entirely a divided highway, including the toll San Mateo-Hayward Bridge. East of Interstate 880 the route becomes a surface street in Hayward. All of Route 92 that is not already a freeway or a bridge has been proposed as a freeway. An upgrade of the intersection with Main Street in Half Moon Bay is in the planning stage. The project took four years, and was completed in October 2011, State Route 92 traverses through significant habitat areas including wetland, California oak woodland and grassland. The San Mateo section was referred to as the 19th Avenue Freeway which was the street name where the freeway now exits. This section is known as the J. Arthur Younger Freeway. Except where prefixed with a letter, postmiles were measured on the road as it was in 1964, based on the alignment that existed at the time, and do not necessarily reflect current mileage. R reflects a realignment in the route since then, M indicates a second realignment, L refers an overlap due to a correction or change, segments that remain unconstructed or have been relinquished to local control may be omitted. The numbers reset at county lines, the start and end postmiles in each county are given in the county column, California Roads portal San Francisco Bay Area portal Caltrans, Route 92 road conditions California @ AARoads. The state highway system of the U. S. state of California is a network of highways that are owned and maintained by the Highway Division of the California Department of Transportation. Each highway is assigned a Route number in the Streets and Highways Code, most of these are numbered in a statewide system, and are known as State Route X. United States Numbered Highways are labeled US X, and Interstate Highways are Interstate X. Under the code, the state assigns a unique Route X to each highway, the California Highway Patrol is tasked with patrolling all state highways to enforce traffic laws. Californias highway system is governed under the states Streets and Highways Code, since July 1 of 1964, the majority of legislative route numbers, those defined in the Streets and Highways Code, match the sign route numbers. For example, Interstate 5 is listed as Route 5 in the code, the state may relinquish segments of highways and turn them over to local control. The state may delete a highway completely and turn over a state route to local control. Business routes are not maintained by the state unless they are assigned legislative route numbers, State Route 14U, an old alignment of State Route 14, is the only one signed as such. Both types of suffixed routes are considered spurs, current or former unsigned suffixed routes include State Route 156U, signed as State Route 156 Business through Hollister, and State Route 180S, the freeway replacement for State Route 180 in Fresno. The first legislative routes were defined by the State Highway Bond Act in 1909, passed by the California State Legislature and these, and extensions to the system, were numbered sequentially. No signs were erected for these routes, the United States Numbered Highways were assigned by the American Association of State Highway Officials in November 1926, but posting did not begin in California until January 1928. These were assigned to some of the legislative routes in California. 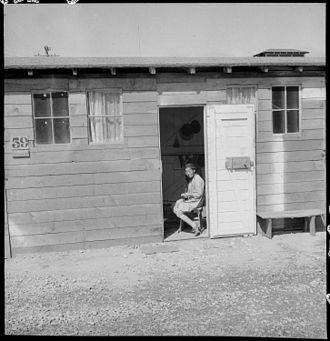 In 1934, after the expansion of the state highway system in 1933 by the California Legislature. Route 82 at the intersection with Mathilda Avenue. The Alameda's tree-lined shopping street. 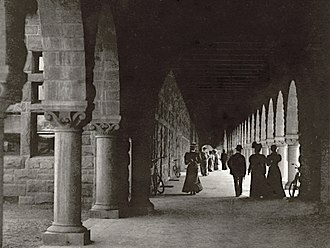 The Santa Clara Mission is at the heart of SCU's historic campus. Downtown La Honda on State Route 84. SR 85 through much of Saratoga and Los Gatos is a sunken highway.